The first ERCIM Workshop on eMobility has been held at University of Coimbra, Portugal on 21 May 2007 prior to the International Conference on Wired/Wireless Communications. More than 20 participants attended this workshop for which twelve presentations have been selected by the international program committee out of 21 submissions. After the official opening by the chair of the ERCIM eMobility Working Groug Torsten Braun, Prof. Luis M. Correia from Technical University of Lisbon gave a keynote talk on "eMobility: present and future challenges". Prof. Correia is a steering committee member of the eMobility Technology Platform (ETP) and chairs the working group on applications. In his very interesting talk, he presented the activities, vision and goals of the ETP. This triggered intensive discussions about the possible future cooperation among ETP and eMobility WG. 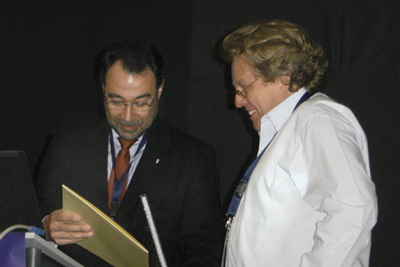 Keynot speaker Luis M. Correia together with Edmundo Monteiro, Universtiy Comibra, the local organizer of the workshop. Three technical sessions complemented the programme. The first session chaired by Giovanni Giambene (University of Siena) on "Traffic Engineering and Mobility Management" discussed the issues of adaptivity and mobility in future mobile networks. It has been discussed how Orthogonal Frequency-Division Multiplexing (OFDM) modulation in 4G networks can be made adaptive to optimize performance and minimize bit errors. Another presentation showed an adaptive layered video encoding mechanism over wireless networks using a fuzzy-logic based control algorithm. A further important issue are the effects of mobility on network performance. The number of handovers can be important for system performance parameters such as call blocking probability. The last talk of this session identified severe problems of handover latencies in Mobile IP networks by analysis of protocols in real test-beds. Significant research efforts seem to be required in the future in order to solve these problems. Another hot research topic has been discussed in the first afternoon session on "Wireless (Sensor) Networks" chaired by Geert Heijenk (University of Twente). Energy-efficiency is a key problem in sensor networks and approaches for communication protocol design mostly rely on cross-layer concepts, where various protocol layers such as routing and medium access control are integrated with each other. Positions of tracked objects and events should be determined as accurate as possible. Several positioning technologies exist. One talk proposed to combine these in order to increase accuracy. Another important issue is security in wireless sensor networks. A variety of security mechanisms exist, but many of them are too complex to be implemented on available sensor node resources. A compiler has been proposed to select and configure appropriate security mechanisms and protocols dependent on application requirements and sensor node node constraints. The final session discussed various issues in "Pervasive Computing and Mobile Applications" chaired by Saverio Mascolo (Poltecnico di Bari). Many context-sensitive applications and services are currently being developed. Context information, eg location or sensor information need to be exchanged. This can be done in different ways, eg by intelligent flooding, shared tuple spaces, or mobile agents. The fourth talk addressed the issue of authentication in a mobile service environment using available technologies from GSM. The first workshop of the ERCIM WG on eMobility has been a big success in particular when considering the quality of the presentations. This could only be achieved due to the excellent work of authors and reviewers. The hosts at University of Coimbra not only provided excellent meeting facilities, but also organized to published printed workshop proceedings (ISBN: 978-972-95988-9-0).